Pre-heat the oven to 180° C. Add the cream and double cream to a small pot, season with a pinch of salt, pepper and freshly ground nutmeg and flavor with some truffle oil. Now simmer the mixture at medium heat for about 6 minutes while stirring. In the meantime cube the ham and cheese and slice the mushrooms. 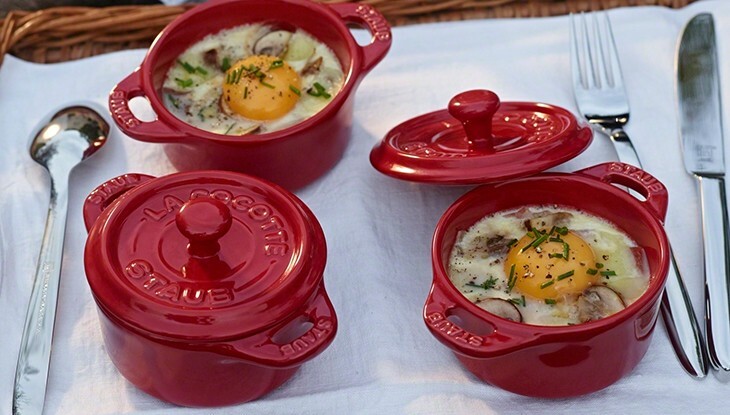 Mix everything together and add to 4 small round STAUB Cocottes. Place on a deep baking tray. Place the deep baking tray in the center of the hot oven and pour in as much boiling water until the small Cocottes are half standing in water. Thicken the liquid egg white in the oven for about 8-10 minutes. When ready the egg yolk and the cream should still be fine and creamy. In the meantime cut the chives into fine rings. Remove the molds from the oven, season the egg yolk with a pinch of Fleur de Sel and some pepper and sprinkle with the finely-chopped chives.